Kent's "Hooligan Libertarian" Blog: Don't be "PC"
"PC", or political correctness (along with its "conservative" twin: patriotic correctness) is the embracing of lies. Or at least the hiding of truth. If you speak the truth the Correctists will try to hurt you. They may even succeed, just because there are so many of them and they have so much power. But they are still wrong. And there's a weakness-- a rot-- at their core, just because of the lies they embrace and tell. Will it cause their destruction in time? I hope, but I don't know. However, I'm not going to lie or hide the truth to protect myself from them, and I won't shy away from pointing out their lies. Even knowing the consequences. Their lies need to be countered with truth. 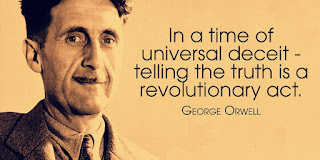 In a time of universal deceit telling the truth is a revolutionary act. As with all truths, this remains true whether or not George Orwell actually said it. To my mind, PC is no more than weaponized peer pressure. Combating it requires pushback, or it amplifies by leaps and bounds in time. That may be the case, but it's still based entirely on lies.